Kalida’s Gabe Hovest putsup a shot against Leipsic’s Wesley Garcia during Saturday night’s Putnam County League game at Kalida High School. 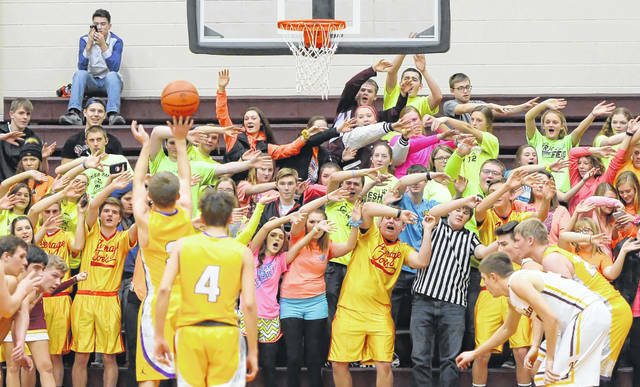 Kalida’s students try to distract Leipsic’s Cole Rieman on a free throw attempt during Saturday night’s Putnam County League game at Kalida High School. Kalida’s Owen Recker goes up for a shot during Saturday night’s Putnam County League game against Leipsic at Kalida High School. KALIDA — Kalida put together two big first-half runs. That, and a smothering defense, spelled too many problems for Leipsic. 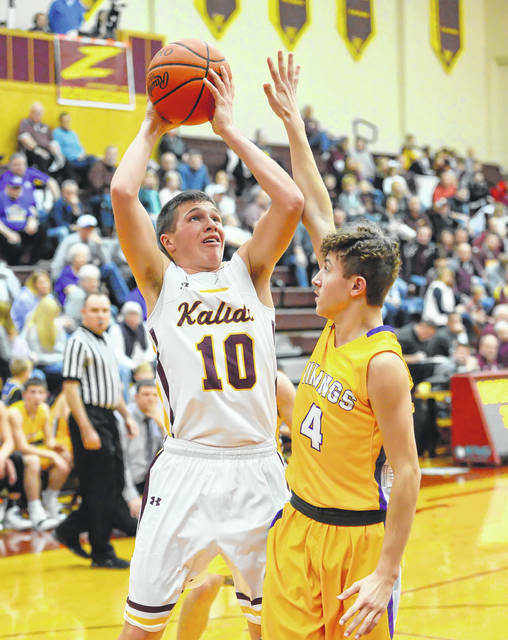 Kalida ran away from Leipsic 59-31 in a Putnam County League boys basketball game Saturday at Kalida. Kalida used its 1-2-2 press and a man-to-man to make Leipsic feel uncomfortable the whole night. That helped the Wildcats knock out runs of 13-0 and 10-0 in the first half. Kalida led 14-5 after the first quarter and 30-13 at the half. Leipsic wasn’t able to make a second-half comeback. Kalida is 10-5 and stands alone atop the Putnam County League at 4-0. Leipsic is 7-7 and 1-4 in the PCL. Lambert led Kalida with 16 points, including seven driving layups. Sophomore Luke Erhart had 11 points and six rebounds. 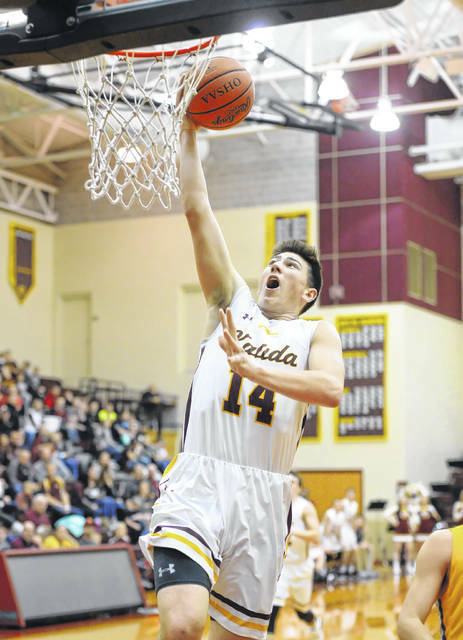 Kalida’s Grant Laudick had eight points and five rebounds. Owen Recker had seven points and eight rebounds. Kalida won the boards, 33-27. Kalida’s defense force 17 Leipsic turnovers. Of Kalida’s 24 baskets, 14 came via layups. Until the final two seconds of the game, Leipsic had only three players who scored. Dylan Schroeder had 17 points and eight rebounds to lead the Vikings. Cole Rieman had six points. Tyler Hiegel had six points on two 3-pointers. Leipsic was chilly from the field early and the Wildcats took full advantage. Kalida went on a 9-0 run to close the first quarter to lead 14-5 after the first quarter. During the run, Erhart hit a 17-footer and a 15-footer. Gabe Hovest knocked down a 3-pointer. Kalida’s run went to 13-0 as it pulled out to an 18-5 lead with 5:51 left before halftime. After Leipsic sank a free throw, Kalida simply went on another 10-0 run to pull out to a 28-8 lead with 2:52 left before halftime. This was came with thanks to its 1-2-2 press which forced Leipsic into eight first-half turnovers. Lambert was continuing to weave his way to the basket for Kalida, as he had 12 points at the half on five driving layups and two foul shots. Leipsic hit just 2 of 14 from the field in the first quarter and was shooting 22 percent at halftime. Kalida shot 55 percent from the field for the game. Leipsic shot 31 percent from the field.